This was Mutant Renegade’s one and only CD release. Way back when it cost over $4 each to produce a CD. I heard we were the first label in the area to release a CD. 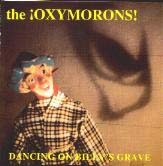 They sold really well, but unfortunately the Oxymorons stopped playing not long after this was released.